Feel your heart pounding and your hands sweating as you come face to face with the infamous Buffalo Bill, Hannibal Lector or Dracula but who knows, anything can happen in the Chambers of Horror. Will you make it out alive or flee running and screaming? The Chambers of Horror also pays tribute to the great Dublin writer Bram Stoker. Stoker wrote his famous novel Dracula at his home in Clontarf, close to Dublin’s city centre. 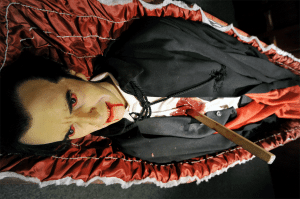 A wax figure of Count Dracula sleeping in his coffin lies in wait for his next victim here in the Chambers of Horror. Watch out it could be you! There is a dedicated section in the Chambers of Horror for the Silence of the Lambs and the Hannibal Movies. Here is where the classic movies come to life quite literary as many of the exhibits are animatronic. So it is safe to say this one is not for those faint of heart! Note : The Chambers of Horror does have an adult theme throughout, therefore there is parental advisory for those under the age of 16. Are there live actors in the Chambers of Horror? For different events, certain times of the year and for Night at the Wax Museum we do have live actors in the Chambers of Horror. Please ask at reception on admission or call in advance to find out. Are the Chambers of Horror suitable for Kids ? Due to the adult theme in the Chambers of Horror there is parental advisory for those under the age of 16. Do you have to go into the Chambers of Horror? Follow The National Wax Museum Plus’s board Chambers Of Horror on Pinterest.